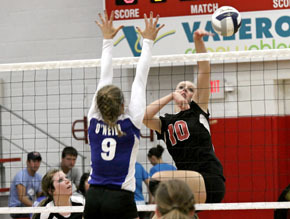 Although Boone Central lost its 2011 volleyball season-opener to the visiting O’Neill Eagles Thursday, Sept. 1, new coach Susan Roberts saw some positives that her team can build on. O’Neill pulled away late in a close first set to win 25-18, then swept the match by scores of 25-16, 25-13. “I felt we came out in the first set and played the kind of volleyball we want our team to be about,” Roberts commented. “We were aggressive and were hustling, especially on defense. But, as the night progressed, we struggled to serve-receive the ball. “We need to overcome our lack of confidence on serve-receive and focus on getting passes to our setter where we can run some offense. BC defeated O’Neill 25-15, 25-19 in the JV match behind a strong service game. The Cardinal frosh scored an exciting 26-24, 25-22 win to open the night.